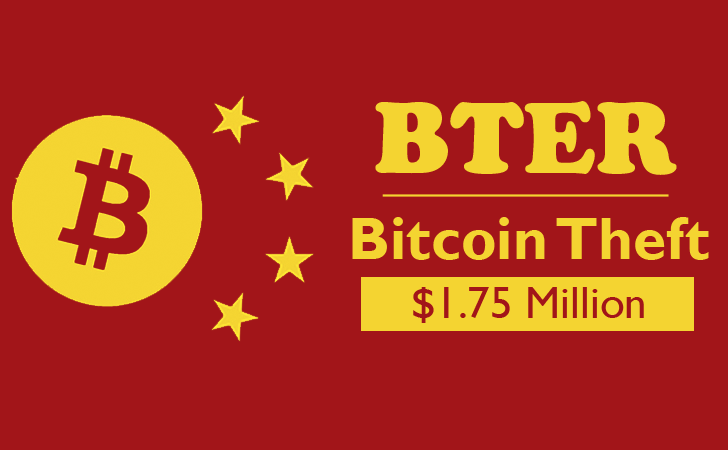 The most popular Chinese Bitcoin exchange BTER announced that it has been hacked on Valentine’s Day and lost more than £1.1 Million-worth ($1.75 Million; one BTC is about $270) of the digital currency. The Bitcoin Exchange hasn't revealed more details about suspects behind the breach or how the cold wallets were compromised, except that 7,170 Bitcoin cryptocurrency was stolen from the company's "cold wallets," a way of storing the digital currency offline. "All wallets have been shut down and withdrawals of unaffected coins will be arranged later," the official website of BTER Bitcoin exchange states. After that the stolen Bitcoin cryptocurrencies appear to have been split into a number of separate wallets since the alleged intrusion. This is the second major Bitcoin hack in past two months. Before this, one of the biggest and most trusted Bitcoin exchange, Bitstamp based in UK was hacked at the beginning of this new year, which lead to the theft of "less than 19,000 BTC" (worth about $5 million in digital currency). The BTER Bitcoin Exchange is now offering a bounty of 720 BTC – roughly $170,000 – to whoever can retrieve the stolen currency back. The company says it will arrange withdrawals of unaffected funds at a later date. According to a Chinese social media platform Weibo, BTER claimed to have been working with law enforcement officials on this issue. This isn't the first time BTER experienced the Bitcoin hack. Back in August 2014, £1 Million ($1.65 million) worth of digital currency NXT was allegedly stolen from the Bitcoin exchange, CoinDesk notes, though most of the funds were recovered.